You, Me, and the Sea on Entertainment Weekly! Author Marissa Stapley recommended You, Me, and the Sea on Entertainment Weekly! The sale and sneak peek is running at all online retailers through April 22nd. Win an advance copy of YOU, ME, AND THE SEA! My awesome publisher is giving away SEVENTY-FIVE (🤩😎😲) copies of YOU, ME, AND THE SEA on Goodreads! Bookstagrammers/bloggers/reviewers: it’s also up on Edelweiss! I would love to see your early reviews. 🤗 Let me know if you have any trouble getting your paws on a copy. DOG CRAZY IS $1.99 AND INCLUDES AN EXCERPT OF YOU, ME, AND THE SEA! All the Summer Girls is on sale just in time for summer reading! Read the book Elin Hilderbrand called a "Beach Book Extraordinaire" for just $1.99! Everywhere ebooks are sold. ...with an adorably updated cover! HOW TO EAT A CUPCAKE: $1.99 RIGHT NOW! American Library Association's Booklist named Every Wild Heart to its Top 10 Women's Fiction List! PopSugar named Every Wild Heart to its Best Books of Spring 2017 List! RT Book Reviews selects Every Wild Heart as a TOP PICK! EVERY WILD HEART available to pre-order now! I'm very excited to share some of the blurbs that are rolling in for my next novel, EVERY WILD HEART! DOG CRAZY E-book is $1.99 Right now! For a limited time, the e-book of DOG CRAZY is available for $1.99 at all retailers, including Amazon! I'm hosting a giveaway on my Facebook page: share the news about the limited time e-book price drop, and I'll enter you to win a signed copy of ALL THE SUMMER GIRLS or HOW TO EAT A CUPCAKE (your choice!). Thank you to all the friends, family, book lovers, dog lovers, and adorable, adoptable dogs (!) who came out to Books Inc. in San Francisco last night to support DOG CRAZY and Grateful Dogs Rescue! What a great night! 1. Snuggling with 8-week-old Agatha (pictured here). 2. Watching FIVE dogs (in two hours!) find their forever homes. 3. Chatting with the awesome dog crazy Pets in Need volunteers. 4. Raising a nice chunk of change for this deserving no-kill animal shelter. Shout out and huge thanks to my publisher William Morrow HarperCollinsfor donating copies of Dog Crazy so that 100% of sales could go to Pets In Need. Huge thanks also to Charly Kayle for inviting me to join this special event. What a great day! With 7 days until DOG CRAZY goes on sale, it's time for the final pre-launch giveaway! This week's prize is a set of 10 Golden Gate Bridge coasters, for your drinking pleasure. To enter, post a picture of your dog to any social media and use the hashtag ‪#‎dogcrazy‬ (and make sure to tag me too so I see it!). I am loving seeing your dog pics! On Twitter, follow me and post a picture of your pet with the words: "I'm crazy about [pet's name]. 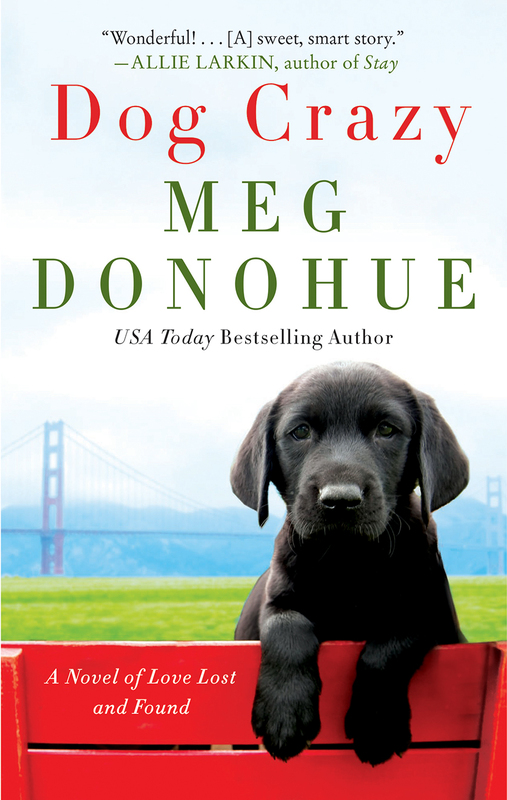 Can't wait to read @megdonohue's DOG CRAZY! #dogcrazy #dogsoftwitter"
On Goodreads, add DOG CRAZY to your "Want To Read" shelf and email me to let me know. This week, I'm thrilled to be giving away a gorgeous tea towel made by my friend Samantha Barksy of San Francisco company Note*ify. If you're looking for beautiful paper or soft goods, check out Note*ify ... and if you want to win the tea towel, check out the entry details below! I love these Wildebeest bandana collars, made in the San Francisco Bay Area. Enter via social media this week and you could win a collar in the design and size of your choice. Win Recchiuti Chocolates - Contest ends 2/16/15! THE GIVEAWAY THIS WEEK (4/10-4/17) IS A BOX OF LOCAL CHOCOLATIER RECCHIUTI'S DELICIOUS CARAMEL CHOCOLATES FEATURING SAN FRANCISCO LANDMARKS. THESE WEEKLY CONTESTS ARE OPEN TO THOSE WHO HELP SPREAD THE WORD ABOUT DOG CRAZY ON SOCIAL MEDIA, SO BE SURE TO TAG ME EACH TIME YOU MENTION DOG CRAZY ONLINE AND I WILL ENTER YOU TO WIN! THE WEEKLY CONTESTS DO NOT REQUIRE A PURCHASE. US ADDRESSES ONLY, PLEASE. If you don't have a pet just post the second sentence above without a picture (or get creative!). Thank you very much for helping me get the word out about DOG CRAZY. DOG CRAZY will be published on March 10th -- that's 4 short weeks from today! This story is near and dear to my heart and I am so excited to share it with you. As I'm sure many of you know by now, pre-ordering a book is one of the best ways to support an author. I would be honored if you would consider purchasing your copy of DOG CRAZY today. I will mail a signed/personalized bookplate and bookmark to the first 100 pre-orders of books, e-books, or audio versions of DOG CRAZY (US addresses only, please). To enter, please email your proof of purchase (emailed receipt or photo of print receipt from local store) to hellomegdonohue@gmail.com with subject line Pre-Order. Books ordered before today are of course eligible! 4 Weeks of Mini-Giveaways, Starting Today! I will also be giving away a fun local product every week for the next 4 weeks leading up to March 10th. The giveaway this week (4/10-4/17) is a box of local chocolatier Recchiuti's delicious caramel chocolates featuring San Francisco landmarks. These weekly contests are open to those who help spread the word about DOG CRAZY on social media, so be sure to tag me each time you mention DOG CRAZY online and I will enter you to win! The weekly contests do not require a purchase. US addresses only, please. Finally, to celebrate DOG CRAZY, we've put together a fun grand prize for one lucky winner. Enter here: http://a.pgtb.me/T0vZgp. No purchase necessary.